Note: This article is part of a series. See the Index for more information. Updates: I haven’t had any reports of issues with this post under the Jessie release of Raspbian, so I assume it all still works. I don’t have a spare UPS to test with, though, so unless someone reports an issue under Jessie, I think everything still works. For this article, I’m assuming you’ve already completed the standalone version in the previous article. If you came straight here from a link or a search, go look at that article first, and get everything working before continuing. 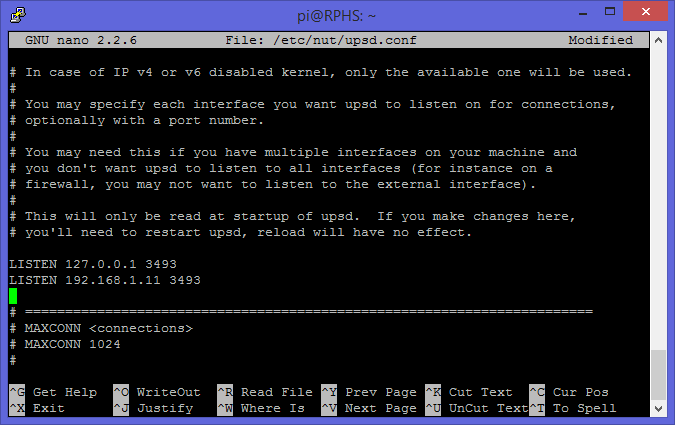 In the previous article, NUT was configured in “standalone” mode, which means that the server and client were on the same machine. It also means that the server isn’t expecting any other clients to be talking to it, so it simply isn’t listening for them. Log in to the Raspberry Pi that is connected to the UPS. 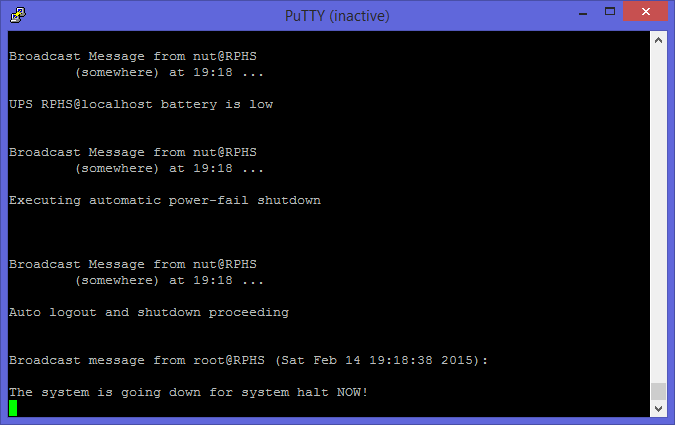 With a little bit of reconfiguration, it will become a NUT server. Edit the NUT configuration file. Like on the server, you’ll need to set up the permissions so that the NUT configuration files are readable by the nut user. Unlike the server, though, you don’t need to touch the upsd.users file because users are defined on the server, not the client. Once again, unplug the UPS, and you should see warning messages appear on both the server and client(s) right away. You may want to mute the beeper if your hardware supports it, and plug something in to help the battery drain faster. Apart from the name of the server (RPHS vs. RPHS2), and the fact that the client shut down first, you wouldn’t be able to tell the difference between the two, even though only the server is actually attached to the UPS. Thanks for your blog articles. Have you considered setting up a media server on your Raspberry Pi? Volumio looks interesting. One of the early articles is about setting up MiniDLNA as a media server. 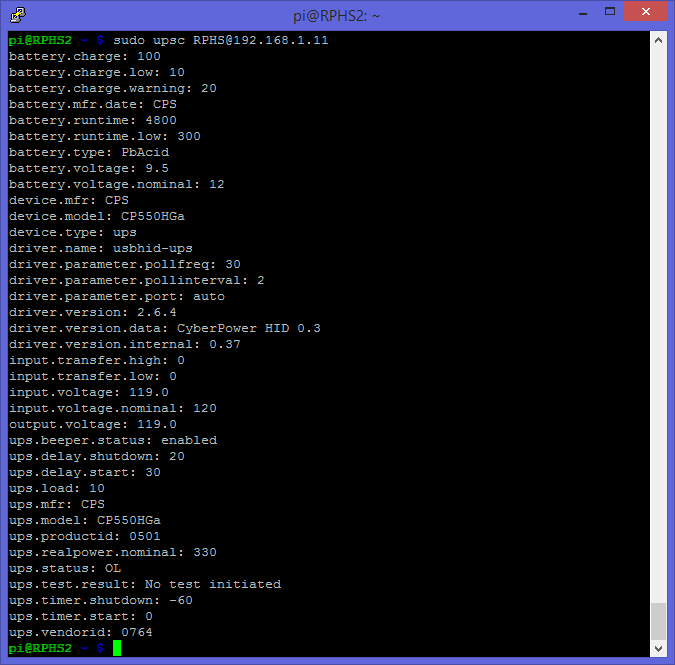 The Pi 2s can run Plex Media Server, but won’t transcode because it’s not an x86ish processor. Hi Mel thanks for your 2 articles. First setup worked like a charm (pi as standalone), but I cannot figure out the 2nd one working (pi as a netserver). After reboot, a “sudo upsc myups” allways give me the following error : “Error: Connection failure: Connection refused”. Any help would be greatly appreciated. Yes I first setup with these 2 parameters, noway. and everything is working like this. Any security problems using 0.0.0.0 (debian beginner…) ? Hey Mel, thanks for the two posts, they are super helpful! Do you have by any chance a thought about a solution for devices with dynamic ip addresses? I would recommend that servers always have fixed IP addresses. You can do this directly on the device, or from the router, which is how I do it.